Browser note: Different browsers act differently with EndNote. Check out the information on browsers on the What is EndNote page. Open the record you would like to import and click on the EndNote Desktop icon under the "Send To" heading. You may see the option ot Open with "ResearchSoft Direct Export Helper" or the file may simply download to your computer. If you get the option to Open with "ResearchSoft Direct Export Helper" and you can just click OK. This will automatically add them to your EndNote library. To add them to your EndNote library, open the file. If the file is listed at the bottom of your browser screen or in a downloads area, just double click on the file. You can download multiple records at once using a folder in Primo. When you find a record you want to download, click on the pin icon on the right of the record. Do this for all the records you want to download at once. When you are done pinning records, go to your favorites (pins) by clicking the pin at the top of the page. Select all the records then click the ellipse (...) above the records. Click on the EndNote Desktop icon under the "Send To" heading. Open the record you would like to import and click on the Export link to the left of the bibliographic information. Make sure that the Direct Export in RIS Format radio button is chosen and click on Save. You can download multiple records at once using a folder in Ebsco. When you find a record you want to download, click on Add to Folder. Do this for all the records you want to download at once. When you are done adding records to your folder, open the folder. Make sure that the Dirct Export in RIS Format radio button is chosen and click on Save. Browser note: Different browsers act differently with EndNote. Check out the information on browsers on the What is EndNote page..
Open the record you would like to import and click on the down arrow by the "Save to EndNote web" link above your search results. Choose "Save to EndNote desktop". Choose the information you want to download - the more information in EndNote, the more flexible it can be. You can download multiple records at once using a folder in Web of Science. When you find a record you want to download, click on the check box next to the record. Do this for all the records you want to download at once. When you are done choosing records click on the down arrow by the "Save to EndNote web" link above your search results. Start with your EndNote library open. Open the record you would like to import and click on the Cite This Item button. Click on the Export a RIS file link. You can download multiple records at once using a folder in JSTOR. When you find a record you want to download, click the checkbox next to the record. Do this for all the records you want to download at once. When you are done adding records, click the Export Selected Citations button at the top of the list. With the record you want to import, click the Send To button and choose Clipboard and click on Add to Clipboard button. Click on the clipboard items link on the right side of the top of the screen. Click on the Send To button again. Choose File and make sure the format selected is MEDLINE then click on Create File. You may see the option ot Open with or the file may simply download to your computer. If you get the option to Open with, choose EndNote as the program to open the file with and you can just click OK. When you have chosen all the records you want to import, click the Send To button and choose Clipboard and click on Add to Clipboard button. 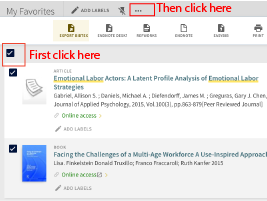 If you get the option to Open with choose EndNote as the program to open the file with and you can just click OK.
With EndNote and your library open, click the white page with the green circle icon. Choose the type of document you have. This is important because citations are formatted differently depending on the type of document. EndNote gives you lots of choices but if you need something special, you can create your own format as well. Enter the information that you have about your document. Close the record by clicking on the grey box with an X at the top right of the record (don't close the program by clicking the red box with an X). You can see the record in your references list. You can import PDF files saved on your computer if the PDF has a DOI within the first two pages. If all your PDF files are all in one folder, you can import them all at once. You must be online to import PDF files as EndNote will go to the International DOI Foundation's website to get the bibliographic information on an article. In EndNote, click on the File menu. Mouse over Import and choose Folder. Choose the folder your PDFs are in. You can choose to import all records, have duplicate records saved to a separate library, or discard duplicates. Click on Import (if you have a lot of PDF files, the import can take a while). The records with only an odd title below do not have a DOI but the bottom two have DOIs and were imported correctly. Authors deserve a special note. They must be entered correctly in EndNote for your citations to be correct. Here are some tips about authors. Each author should have his or her own line. Enter author full names whenever possible - EndNote can abbreviate names from full names but cannot use full names if only abbreviations are in the record. Names can be FirstName LastName or LastName, FirstName but be consistent within a record. Check the names downloaded from databases against the actual article - databases can make mistakes on names. Corporate authors should be put in with a comma after the corporation name (e.g. South Dakota State Univeristy,). In EndNote, make sure you have set the Find Full Text preferences (see the preferences tab in this guide). Highlight the records you want EndNote to look for. EndNote will try to find full text in our databases, download the PDF files and attach them to the records. Note that this procedure works to find about 50% of what we have available. In EndNote, click on the record you want to add an attachment to. Click on the References menu, mouse of File Attachments and click on Attach File (or right click on the record, mouse over File Attachments and click on Attach File). Find the PDF or other document on your computer and click Open. Note that you can attach any type of file to a record in EndNote.